One upon a time I drank milk. I really wanted to keep him in my life though, so I played super cool girlfriend, and tried to drink whole milk alongside him. Then I realized whole milk was like, really really fattening. But I couldn't ever go back to drinking nonfat. Ever. Then I couldn't handle milk in any form. Then I discovered almond milk. Here I am years later, and I am still drinking the stuff everyday! I freaking love almond milk! I mean, LOVE! It goes in my morning tea, in my granola or oatmeal, in a glass for dinner, etc etc. 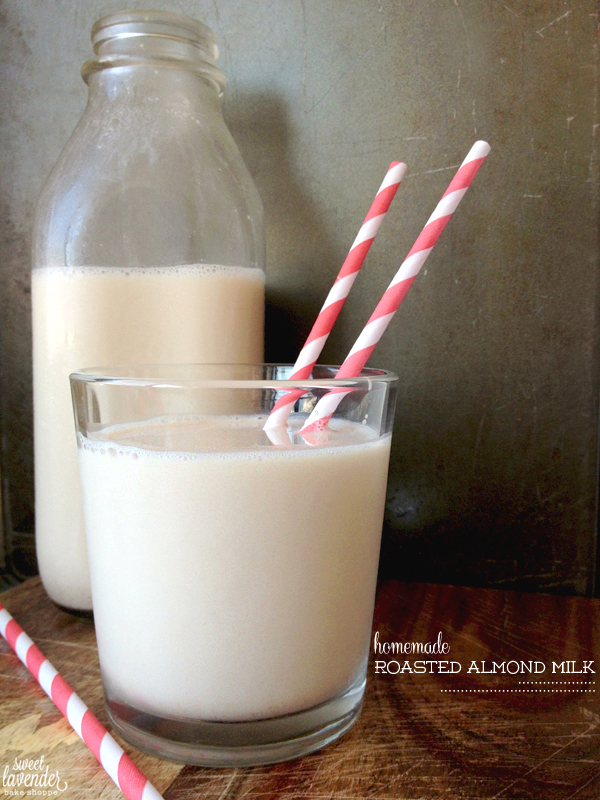 I've also started experimenting with almond milk in recipes and desserts! It's a total kitchen staple in our house (as is a half gallon of organic whole milk...for...well, you know who) and has been for quite some time. I've tried soy milk, I've tried coconut milk (honestly, kind of like this), but nothing compares to the almond kind- in my humbled opinion! So you can imagine my delight when I started noticing recipes allowing you to make your own! How fun! Typically at home, I purchase unsweetened vanilla almond milk from Trader Joe's. Can't go wrong in that department! It's thick, creamy, flavorful, and just plain yum. Then, as I was researching homemade versions, I started to read the label of my beloved friend. There is clearly a lot going on in that cardboard carton! Not just almond milk- but things like gellan gum, natural flavors (?? ), sunflower lecithin and so on :( Pooey. In a pinch, I'm sure I'll still get the stuff (because....well, I'm a creature of habit) but why not try to, yet again, eliminate unnecessary processed foods from my diet? Baby steps guys. It's all about baby steps when trying to rid your lifestyle of possible yucky things. Our road to unprocessed eating began last year with "unprocessed October" and has been a continual slow process of finding ways to cut something out of our diet and/or possibly make it at home from scratch instead. But, if you're determined, you can totally do it! I have a few of our favorite recipes that we've found along the way, here on the blog! Just search, "unprocessed" in my blog's search bar! For this delightful beverage, I wanted to try something new. I wanted to see if I could take standard pick-up-a-bag-from-your-local-trader-joes ROASTED almonds, skins on, and make milk out of them. 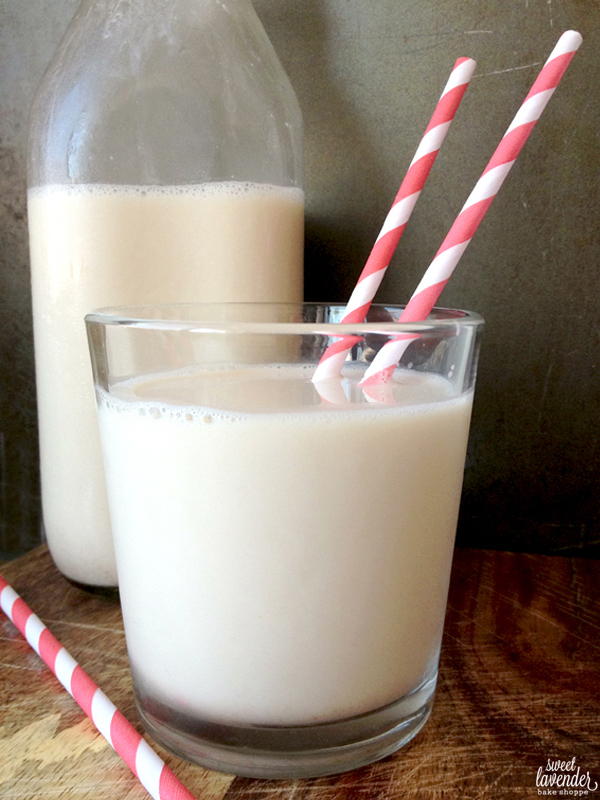 I found recipes using blanched or raw almonds (no skins), and that's fine and dandy- but I wanted a super flavorful and very easy to make, drink! I wanted my milk to be nutty, roasted and super almond flavored, and also needed to include vanilla. I didn't want to skin the suckers and I definitely didn't want to soak them overnight in the fridge. What if I ran out of milk like...right now and needed some today??? Ain't no one got time to allow little almonds to have a gentle soaking overnight. They need to be burned to death with boiling water and pureed into oblivion for my drinking pleasure, NOW! This almond milk fit the bill perfectly. Very nutty with a definite roasted flavor! The vanilla doesn't stand out but rather marries and melts in the background, and creates a nice, warmer flavoring for the palate. AND IT'S SO EASY TO MAKE. Start to finish- maybe an hour and a half. If you're slow like me. It's not as thick as store bought- but why would it be? There's literally 3 ingredients total (not counting the optional ones for added yumminess). None of that "thickening" and "preserving" stuff. So that does take some getting used to. But shoot...so so happy about this new addition to the family! I have literally made this 4 times in a row now, and am TOTALLY addicted. 1. In a medium bowl, add your whole almonds. Skins are totally fine! Bring 2 cups of your filtered water to a boil. Pour over your almonds and cover bowl with plastic wrap (my bowl included a lid, so that's what I used). Let sit on counter for at least 1 hour (I let mine sit for 4 hours). 2. Next, add soaked almonds, their warm water, your vanilla extract, honey and cinnamon to a blender or food processor. Puree on high until frothy, white, and creamy- about 2-3 minutes. 3. Pour mixture into a large bowl and add remaining 4 cups of filtered water. Whisk and stir together- making sure to really break up the almond puree that was created while blending. Let sit 5-10 minutes. 4. While that is resting, get out another large bowl and add a fine mesh sieve. This will catch most of your almonds. For a smoother milk, you can line your sieve with cheesecloth. 6. When you feel you've adequately pressed, get out a clean/dry tea towel and dump your almond solids into it. Remove cheesecloth (and discard) if you used, and wrap towel up like a package. Over your bowl of milk, squeeeeeeeeze and twist your towel! Yep, even more liquid will come out! (See top right picture.) I had my husband do this part because he's WAY stronger than I am! 7. 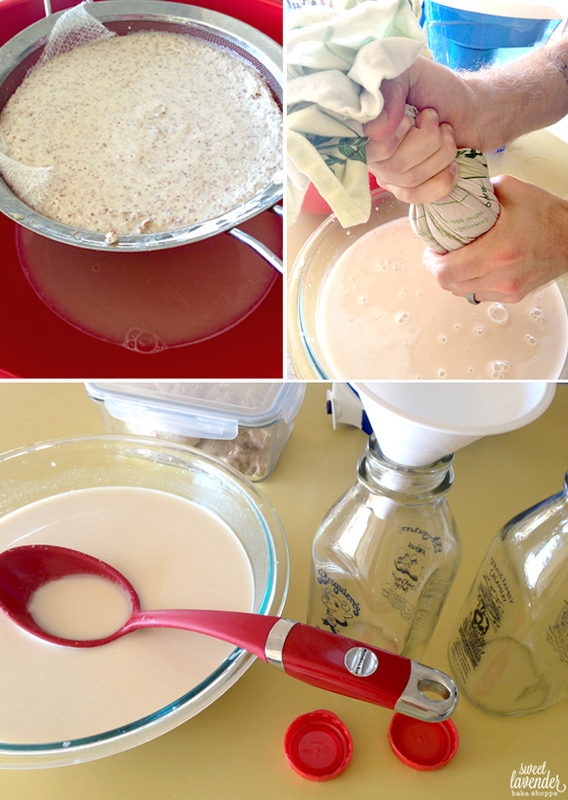 Finally, carefully pour your milk into pitchers and store in the fridge for up to one week! Make sure you shake before using, each time. MmMmmMmm! I am literally drinking coffee (What? I was tired today!) with this stuff in it, as we speak. Oh my goodness gracious is it good! Talk about a delicious roasted almond flavored coffee beverage. It's pumping up the jam in this drink, right now! Oooo I have been wanting to try this!!! Thanks friend :) Pinning it!